It is really all or none with me. I think I have one top that is orange, but now that it's being seen everyone I have made several tangerine purchases. Darn those subliminal messages. 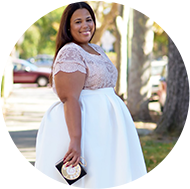 Anyways, this post actually is giving me a chance to review a piece from Eloquii. This is the first piece that I have purchased. I love this dress in particular. It's easy to wear and make for a great spring/summer frock. It's good quality, pretty much what you would expect from any major retailer. The fit of this dress is on the large size. The lining and be a bit snug, but I always cut out the lining of garments. They just end up being constricting and unflattering. I ordered a size 20. I could have easily ordered one size down. I always order big for fit purposes, because I can always go to the tailor. The only thing I that I didn't like about the dress was that the back was supposed to have a bow on the back at the nape of the neck, but there are just buttons. You look great! I bet there's a way you can add a bow, maybe get some silk fabric or something. ok, LOVE this dress!!!!! The first picture is the BOMB! this is your color girl! Very cute! I'm a 14/16 & have unfortunately found that Eloquii just runs too large for me to wear. It's really a shame because their stuff is so cute, & I'm usually too big for straight sizes. I thoght of getting this dress but was nervous about the sizing, wish I would've gotten it. You look great! Adore! This dress is perfect...and the shoes...I LOVE IT! Agreed -- The clothes are fine, but nothing different. This was the first and only thing I was compelled to buy. Thanks! My huny gave it to me. cette coupe de cheveux te va tres bien, j adore!!! et le orange est sublime sur toi!!! love it, love it, looove it! great colours, fab dress, perfect on you my dear!! Very pretty dress!! The color is great on you! Love the pics! It looks like you had a good time taking them. The dress is so adorable, you truly look like spring! I was interested in your comments about lined garments - I look for things with lining because I find that it makes my items fall better/smoother. Except in plus size garments, the lining is sometimes cheap or the wrong fabric for the garment so then I have to cut it out and wear a slip, which annoys me. Any suggestions? I love the tailor too, by the way - sometimes just a little stitch makes something picture perfect! Hi Juliette, I dont really have any other suggestions -- if the lining is in the way I cut it out and wear my own undergarments underneath, which I guess serves as lining. I love this dress, it definitely reminds me that Spring is around the corner. You look amazing! This dress is absolutely gorgeous on you! The color is so vibrant! I miss Eloquii. You look fabs in this dress.